The long-awaited return of official Dungeons & Dragons pdf releases happened earlier this month. A selection of pdfs from all versions of D&D is now available on DriveThruRPG as well as a new D&D-only storefront called D&D Classics. While the initial selection is only about 80 books, additional D&D pdfs will be added to the store over time. 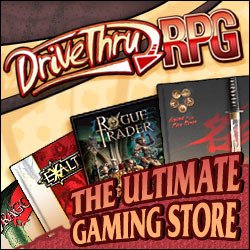 I’m very happy to see that Wizards of the Coast partnered with OneBookShelf, the company that runs DriveThruRPG. As WotC discussed their plans to do a digital release of their back catalog, I worried that they would end up with their own marketplace and/or a non-pdf format that would be poorly supported or limited to a single platform. For an example, Games Workshop has opted to use iBooks for their digital releases which means that I’m not able to read them on any device that I own. Partnering with OneBookShelf should also help bring more customers to DriveThruRPG and encourage them to explore the numerous other gaming pdfs that are available there. One big hole in the current selection is a lack of core rule books. 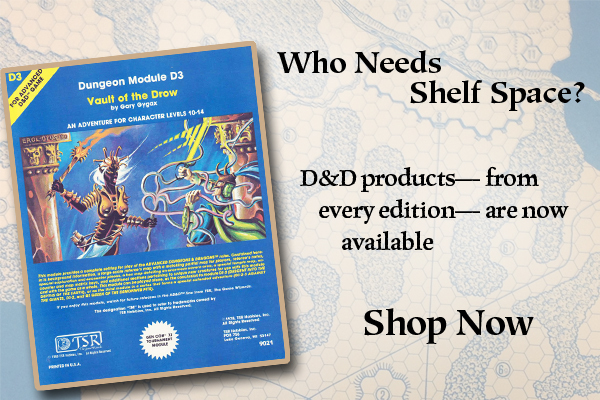 While the 1981 Moldvay version of the D&D Basic rulebook is available, no other core product pdfs are in the store. The core books for 1st, 3rd, and 4th edition are available as actual books right now, and 2nd edition will be in stores later this year. The lack of pdfs still could be a barrier for players looking for a lower price point than the deluxe versions or who simply prefer electronic copies. D&D Basic Set Rulebook: If you’ve never played an old version of D&D, then this is a good opportunity to try it out. I’ve owned a hard copy of this for a while and enjoyed reading it just for the perspective it gave me on how the game has developed over the years. Keep on the Borderlands: This adventure was packaged with the D&D Basic Set Rulebook and is a classic adventure. It is the basis for the Caves of Chaos adventure included in the D&D Next playtest. In Search of the Unknown: Another adventure for D&D Basic, In Search of the Unknown is currently available for free. While I’ve only read a bit of the adventure since downloading it, its hard to argue with the price if you’re looking for an adventure to go along with the D&D Basic rulebook. Bastion of Broken Souls: As I’ve written before, this is one of my favorite adventures. It was the final adventure in the series written for D&D 3e and pits the high-level player characters against the mighty dragon Ashardalon. If you enjoy high-level D&D and want some inspiration, then I’d recommend this one even if you aren’t interested in running a third edition game. Unearthed Arcana: This is a book of optional rules for D&D 3.5 that is essential a d20 system hacker’s guide. It has everything from variants of the common races and classes to alternate health systems. If you enjoy tinkering with house rules or writing games, then this is a great source of examples and ideas that could be applied to any game system. While I’m happy with the current selection of pdfs as a starting point, there are a few products that I hope to see available in the near future. First, it would be great to have the core books for each edition available as pdfs. Next, I’d love to see back issues of Dungeon and Dragon magazines, including compiled versions of some of the 4e-era magazines that were only available as article pdfs. Finally, I hope some of the Eberron books for third edition become available soon since it’s by far my favorite official D&D setting. Which pdfs would you love to see up on D&D Classics?